The Blue Sky Press (Scholastic), 2016. 32 pages. Hooray! 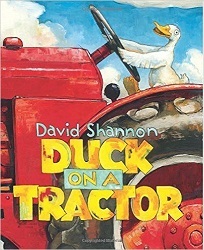 A sequel to David Shannon’s classic, Duck on a Bike! Though as is best with a picture book series, you don’t have to read the first one to appreciate the second. Down on the farm, Duck sometimes got wild ideas. One day he decided he could ride a bike, so he did. Then he spotted the tractor. So Duck starts driving a tractor and convinces all the other animals to ride along. The fun part here is where we hear what each animal says (an animal sound) – and then what that animal is thinking. Deputy Bob blabbered, “If that don’t beat all!” But what he thought was, “How am I gonna explain this to the sheriff?”. . . The Mayor almost choked on his pie. “Good gravy!” he sputtered. But what he thought was, “Those pigs are even fatter than I am!”. . . This is silly fun, and I’m looking forward to trying it for my next storytime. I think it will work best with older preschoolers and early elementary school kids, since there are lots of words on each page and some inside jokes. We’ve got farm animals, a big tractor, and a silly situation. This one’s destined to be another classic.